EDFU's President, Sheldon Williams, was one of the 2018 recipients of the NAACP Roy Wilkins Renowned Service Award. The ceremony took place on July 17, 2018 in San Antonio, Texas during the 109th National Convention at the 43rd Annual Armed Services and Veterans Affairs Luncheon. Recieving the award from Barbara Sapp Davis and Alphonso Braggs. 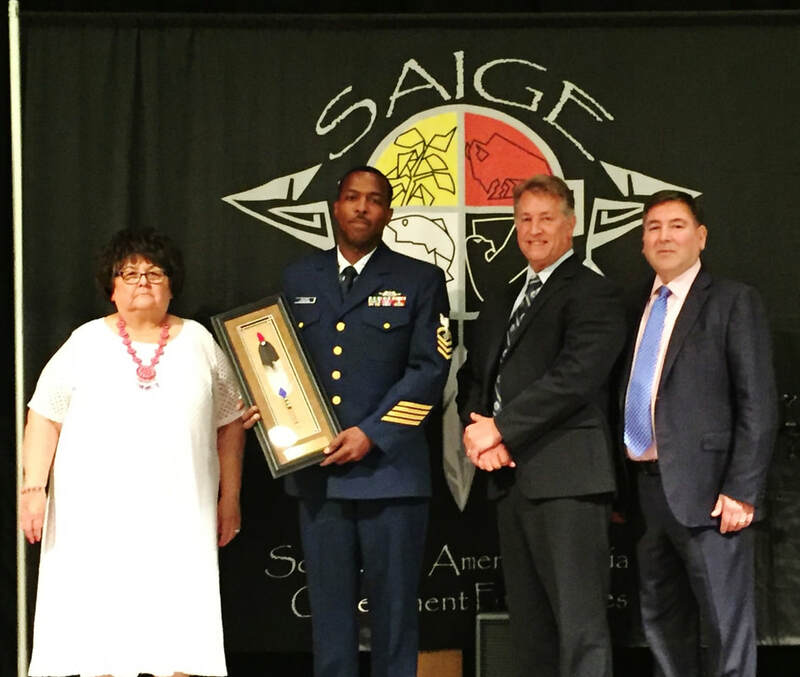 EDFU would like to give recognition to our founder and president, Sheldon Williams, for winning the 2018 Society of American Indian Government Employee (SAIGE) Meritorious Service Award at the Society of American Indian Government Employees Conference! The ceremony took place June-14 in Green Bay, Wisconsin! 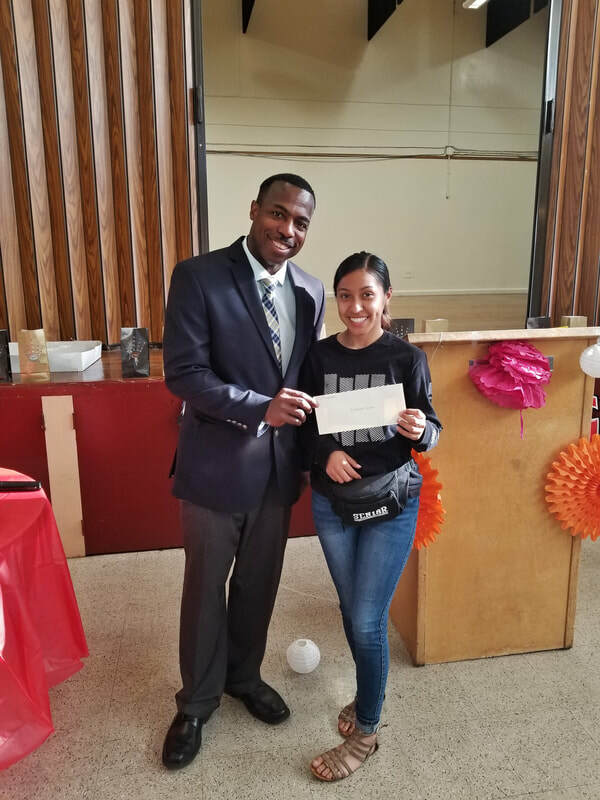 On June 7, 2018, EDFU presented Natalie Deleon with a $250 scholarship for being the Sean Moler Scholar Athlete of 2018. This is the 2nd year EDFU has sponsored this scholarship opportunity for graduating students at OMI High School. Miss Deleon aspires to be a nurse and is hoping to get into a prestigious med school. EDFU and Deniran Films would like to thank everyone who put forth funding towards "The Making of a Slave" during the INDIEGOGO campaign. While the main goal of $500,000 was not met, we did raise $4,930 and the movie will go into production this summer. Stay tuned for more updates! On February-6, 2018 EDFU coordinated a trip to Google headquarters for the youth of Oakland Military Institute (OMI). President of EDFU, Sheldon Williams, was on hand to guide the children on their field trip and give them a unique and inspiring opportunity. The children had fun touring Google and really enjoyed the food! EDFU would like to thank Google for allowing them to have this opportunity and looks forward to working with them and OMI in the future! EDFU's first partnership with the NBA's Golden State Warriors was a success! The ticket fundraiser was also the first major fundraiser for EDFU and we look forward to many more in the future! The event took place on February-8, 2018 for their African American Heritage Night at the Oracle Arena in Oakland, California. We'd like to thank the Golden State Warriors organization for the opportunity and all 16 participants! A big congratulations to the Golden State Warriors on their victory over the Mavericks, as well! In early April, founder of EDFU, Sheldon Williams, went to New Zealand to make connections with the Maori who are the indigenous people of New Zealand. Together, they worked on solutions for the good of all indigenous peoples. Visiting the Maori Tekahaoterangatahi and giving them a signed copy of "Shaft" by David Walker and art by ZeeCee Art. 2 Polynesian Panthers: Wil Liolahai and Zac Wilson. True legends in the struggle for indigenous peoples. With Will Liolahia of the Polynesian Panthers at MUMA. - Nga Tupu Hou supporting Maori helping Maori. Marice giving us a proper Maori Welcome. Judge, Caren Fox, and Sharon Holding holding a signed copy of "Niobe" by Amandla Stenberg and Sebastian A. Jones. Statement of Edfu Foundation an indigenous people’s organization. However how can self- determination or full realization of health be achieved when indigenous people live under constant threat of death when exercising their rights of self -determination with respect to their political status and freely pursuing their economic, social and cultural development? For example, environmental activist Berta Cáceres, leader of the indigenous Lenca people of Honduras, who was exercising her rights of self-determination by organizing indigenous people to protest the Agua Zarca dam. The Lenca were concerned that the dams would compromise their access to water, food and materials for medicine, and therefore threaten their traditional way of life. Their social and cultural development as outlined in Article 3 of the DRIP. Berta Cáceres was found shot dead in her home in Honduras on March 3, 2016, because of her activism. Berta Cáceres had faced incessant threats of kidnapping, sexual assault and death against her and her family. However she continued to exercise her rights of self-determination which should have been fully protected. Unfortunately her bravery resulted in her death. Since her death at least three activists have been killed for opposing the Agua Zarca dam. Most recently Lesbia Janeth Urquia another environmental activist in Honduras was also found murdered. Since 2015 at least 10 indigenous environmental activists have been murdered in the Americas. Respectfully, Mr. Chairman and the EMRIP Consul; a study on the right to health and indigenous people will be incomplete without considering the negative effects of the countless and continual terroristic actions unleashed on indigenous peoples who seek self-determination in their communities. Speaking as an indigenous person from Turtle island, also known as the Americas I am well aware of this continued pattern of terror, colonization, genocide and imperialism which results in intergenerational trauma, and Post Traumatic Stress. This is a serious public health issue that needs to be addressed, given greater attention and finally resolved. There have been many studies which detail and layout the ramifications of this trauma. Such as Dr. Joy Degruy Leary’s Post Traumatic slavery syndrome , Haunting Legacies: Violent Histories and Transgenerational Trauma by Gabriele Schwab and Pierre Fossion’s Family Approach with Grandchildren of Holocaust Survivors. Intergenerational trauma is the transmission of historical oppression and its negative consequences across generations. Centuries of genocide, forced enslavement, and assimilation followed by systemic and structural racism and oppression have resulted in intergenerational maladaptive behaviors, which originated as survival strategies. However the syndrome continues because children whose parents suffer from intergenerational trauma are often indoctrinated into the same behaviors, long after the behaviors have lost their contextual effectiveness. This is a major public health and as such should be included in any study on the right to health and indigenous people. The right to health should encompass more than just addressing suicide under mental health. As illustrated in section 5 of the study. As noted in the study provided section I.4. Indigenous peoples’ conceptualization of “health” and wellbeing is generally broader and more holistic than that of mainstream society, with health frequently viewed by indigenous peoples as both an individual and collective right, strongly determined by community, land and the natural environment. The Permanent Forum on Indigenous Issues has noted that the right to health “materializes through the well-being of an individual as well as the social, emotional, spiritual and cultural well-being of the whole community” (E/C.19/2013/L.2, para 3). Indigenous concepts of health often incorporate spiritual, emotional, cultural and social dimensions in addition to physical health. Without addressing this issue in a holistic manner we risk vicarious learned helplessness of our youth instead of desired goal of health and self-determination as outlined by the DRIP. We look forward to a revised study a stronger mandate and moving towards and actualized DRIP. The Sash Ceremony is a yearly event held exclusively by The KaLu Akademy & Early Development Center, a private, cultural educational program arm of The Temple of Human Spirituality in affiliation with Edfu Foundation. Join us as we share some of our program with the community as well as the accomplishments made by our Skarabs during the year. The KaLu Academy is unique in that it is not based on a grade to grade system like Western education. We, instead, have a three Sash system that is based on a curriculum structure created by the founder of The KaLu AKademy, Dr. Karaam Ellis-El. The Sashes represent a cycle of information, of development and of grooming for the Skarabs and allows them to move as fast as comfortable to them. In our Sash Ceremony, we acknowledge the accomplishment of our Skarabs and prepare for the continuation of our work for the coming academy year. We hold a commencement ceremony for any Skarabs who are graduating (Sash II completed) from the Academy. While still within the revenue districts of the city, we are compelled to match the Western educational calendar for the convenience of the working parents but soon, we will begin to utilize the true calendar, the solar calendar which will put us on a 38 hour day. This means that we will move faster and accomplish much more than we ever did. Today, we want you to celebrate with us. 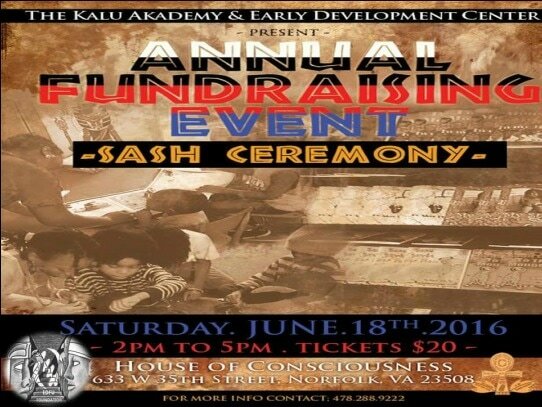 Celebrate the achievements of our Skarabs, celebrate the potential that KaLu has to offer our communities, celebrate the growth that we have attained in our few years here in Hampton Roads and celebrate what KaLu will bring for the coming days, weeks, months and years. We thank you for sharing in our growth and hope you enjoy our presentation. Tawuhaat. Juneteenth is the oldest celebration of the end of slavery in the United States of America. Join us for a day of racial healing, reconciliation and also to promote awareness about the ongoing problem of human trafficking and modern slavery. 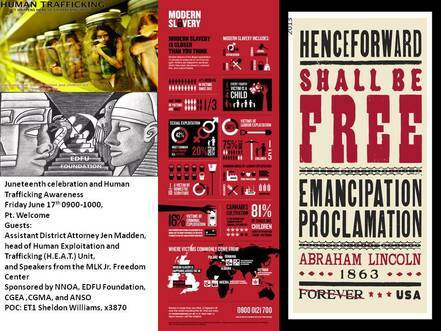 There are still over 35 million people enslaved in the world today, mostly women and children. There will be speakers from The MLK Jr. Freedom Center and The H.E.A.T Division of the Alameda County District Attorney's Office as well as A performance from praise dancers and Omega Psi Phi fraternity. Join us for this inspirational healing program designed with a First Peoples worldview. Here you will find both recent and past events and news from EDFU.